Open House is what it says on the packet! Free to join in. Play games with players who will help you learn how to play and hone your skills. Get the heads up on the new Core 2019 set! Special promos if you bring a friend, introduce someone new to Magic. New free Welcome packs. The Core set returns! Get a Prerelease pack with 6 boosters, an embossed rare or mythic-rare card and a die. Build a deck and play a 3-round tournament. Prizes; 1st place: 4 ‘Core 2019’ boosters, 2nd place: 3 boosters, 3rd place: 2 boosters, 4th place: 1 booster. Last place: 1 booster. Special FREE promo cards just for joining in. Prizes every session! Friday 6th July: – ‘Casual – bring a friend and get a new promo card each! 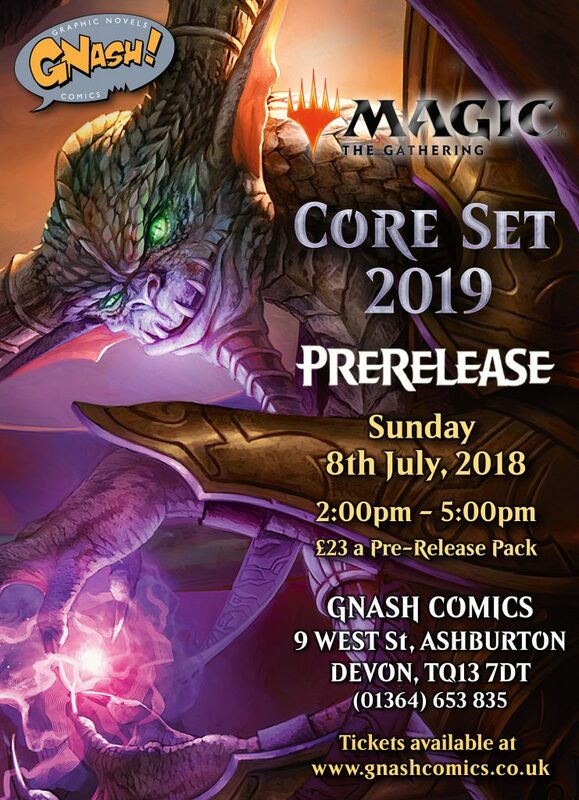 Friday 14th July: ‘Magic 2019 Core Draft – 7pm-9pm – £12 to join – take 3 booster packs, pick & pass cards and build a small deck alongside other drafters. Play a 3-round competition with your decks to see who made the best one! Prize of 2 ‘Core 2019’ booster packs for 1st place! Friday 20th July: ‘Modern format’ – Casual Tournament – 6pm-9pm –(Cards from 2003 and on.) prize of 2 ‘Aether Revolt’ booster packs for 1st place winner! Friday 27nd July: ‘Standard Showdown’ Tournament – (Cards from ‘Kaladesh’ / Sept 2016 onwards.) Prize of 2 ‘Dominaria’ booster packs for 1st place! Top 3 players also get ‘Standard Showdown’ prize packs! 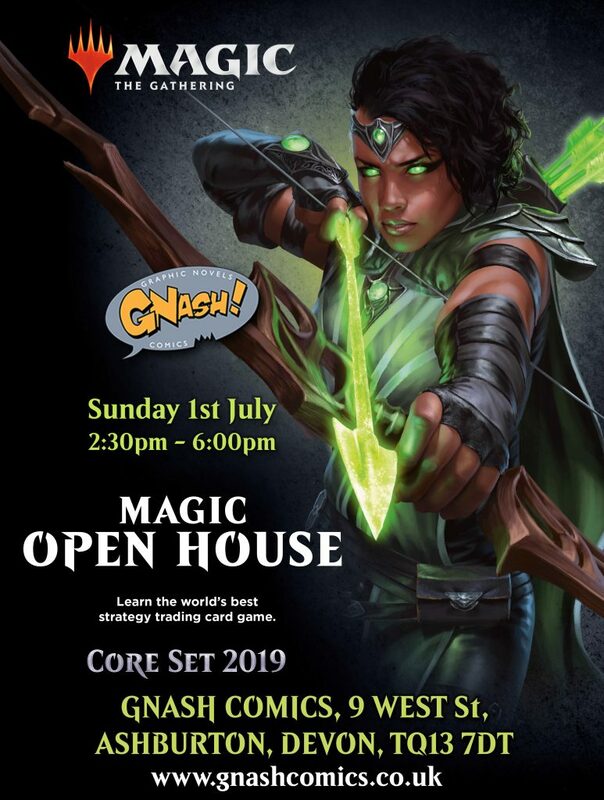 Attend any three Magic events at Gnash Ashburton or Monday nights at Totnes & earn a free loyalty card that gives you 10% off all our Magic products and card-gaming accessories!